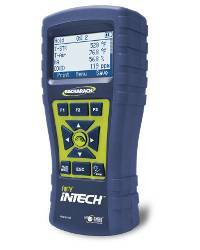 Bacharach Fyrite Intech BASIC Residential Combustion Analyzer for Oxygen (O2) 0-20.9% and Carbon Monixide (CO) 0-2000ppm. Easy-to read display. 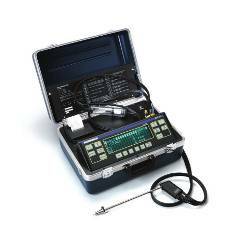 Includes instrument w/O2 sensor, B-Smart® CO sensor, Temperature, probe and soft or hard case. Optional rubber boot. CE Approved. Based on the same technology as Bacharach’s Fyrite ® commercial units, the Fyrite ® InTech ® is an advanced, American-made, residential combustion analyzer that delivers quick, accurate measurement of oxygen, carbon monoxide, stack temperature and ambient temperature. It helps to reduce service call times by providing accurate, electronic test results instantly via intuitive, push-button operation and a menu of 6 selectable fuel types. A new, high-contrast LCD graphic display, with backlighting, makes your results easy to see in any environment and can be output via an optional wireless printer and reporting kit. 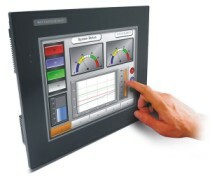 Designed to calculate the efficiency of residential furnaces and combustion appliances by measuring the stack temperature and the percent oxygen level in the flue-gas stream, The Fyrite ® InTech ® also features B-Smart ® sensor technology which enables simple, in-the-field pre-calibrated sensor replacement, which minimizes instrument downtime and provides a low cost of ownership. The instrument is light and fits in the palm of your hand, making it easy to handle. The B-Smart ® Sensor Exchange Program allows users to replace pre-calibrated sensors in the field, eliminating the need to send the instrument in for calibration. With the B-Smart ® Sensor Exchange Program, you receive factory-calibrated sensors, just plug them in and continue to use your instrument – there’s no down time and it saves time and money. > COMBUSTION > OXYGEN+CO : 7 Items found. 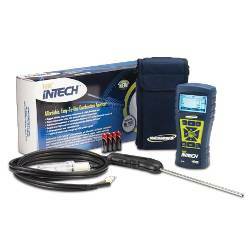 Bacharach Fyrite Intech REPORTING KIT Residential Combustion Analyzer for Oxygen (O2) 0-20.9% and Carbon Monixide (CO) 0-2000ppm. Easy-to read display. Includes instrument w/O2 sensor, B-Smart® CO sensor, Temperature, probe, rubber boot, spare filters, printer, FUS software, USB cable, hard case. CE Approved. Bacharach Fyrite Insight Plus Basic Residential Combustion Analyzer for Oxygen (O2) 0-20.9% and Carbon Monoxide (CO) 0-4000ppm. HVAC Assistant. Full color display. 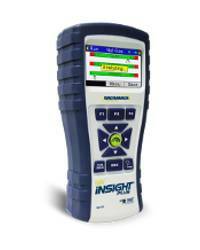 Includes instrument w/O2 sensor, B-Smart® CO sensor, probe, rubber boot, filters and hard case. CE Approved. 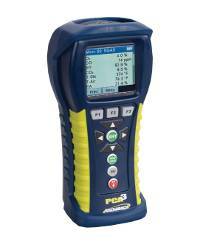 Bacharach PCA3 225 Portable Combustion Analyzer for Oxygen (O2) 0.1-20.9% and Carbon Monoxide (CO/H2 compensated) 0-4000ppm. Full color display. B-Smart replaceable sensors. Up to ten different fuels. ABS Housing. Alkaline Batteries powered. CE Approved. Bacharach PCA3 225 Portable Combustion Analyzer Kit for Oxygen (O2) 0.1-20.9% and Carbon Monoxide (CO/H2 compensated) 0-4000ppm. Full color display. B-Smart replaceable sensors. Up to ten different fuels. ABS Housing. Alkaline Batteries powered. With Printer. CE Approved. Bacharach PCA3 245 Portable Combustion Analyzer for Oxygen (O2) 0.1-20.9%, Carbon Monoxide (CO/H2 compensated) 0-4000ppm and Carbon Monoxide (CO-High) 4001-20000ppm. Full color display. B-Smart replaceable sensors. Up to ten different fuels. ABS Housing. Alkaline Batteries powered. CE Approved. 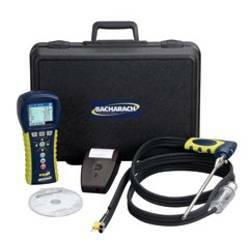 Bacharach PCA3 245 Portable Combustion Analyzer Kit for Oxygen (O2) 0.1-20.9%, Carbon Monoxide (CO/H2 compensated) 0-4000ppm and Carbon Monoxide (CO-High) 4001-20000ppm. Full color display. B-Smart replaceable sensors. Up to ten different fuels. ABS Housing. Alkaline Batteries powered. With Printer. CE Approved. Bacharach ECA 450 Combustion Efficiency & Environmental Analyzer for Oxygen (O2) 0.1-20.9% and Carbon Monoxide (CO/H2 compensated) 0-4000ppm. Large and easy to read display. 100-240V input. Stores over 1000 test records. Draft, Stack Temperature, built-in printer and 12" sample probe w/15' hose assembly. EPA/ETV Test Verified.